The Sanskrit Verses given below, which are contained in the Vijnana Bhairava Tantra and should be of great interest to all Spiritualists who are engaged in higher levels of Meditation, especially the dedicated practitioners of Kundalini Yoga. These verses describe the highest form of Kundalini Meditation or the Meditation to liberate the mind and body of its limitations and evolve to higher levels of existence and ultimately come nearer to the Universal or Divine Energy. The true meaning of this verse is that while Meditating on the Universal Energy, the practitioner should forget about the existence of his body and believe that the body is nothing but a part of the Universal Energy. This appears to be the easiest form of Non-Dual or Advaita Meditation, the practitioner by sincere practice is able to dissolve the difference between the Atma and the Parmatma. The meaning of this verse is that when the mind is dissolved and merges with the over-existent, then the true nature of the over-self is revealed. This verse is similar in nature to the one mentioned above, it advises the practitioner to dissolve his mind and merge it with the Universal Mind. This is achieved by sincere Meditation, which is done with confidence and self-belief. The meaning of this verse is that the person engaged in higher Meditation should Meditate that the impurities of his body are being burnt by the Kaalagni, then only will one experience true peace. 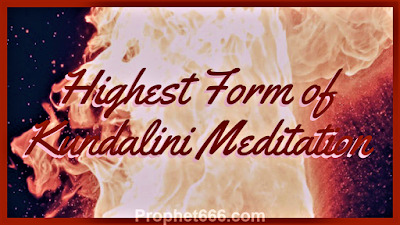 Here the Kaalagni means the radiant light or eternal flame. By Meditating that the impurities in his body are being burnt by the eternal fire, the practitioner will be able to remove the blockages or malfunctioning of the various Chakras or energy centers present in the body. Here the meaning of the body should be taken as the physical, mental and the astral body. The meaning of this verse is that the Meditation with firm self-belief that the entire Universe is being cleansed by the Kaalagni, elevate the level of the practitioner to that of a highly evolved being. This Meditation transforms the practitioner from a human to a superhuman, this is the Meditation, which transformed ordinary mortals into saints and highly evolved Siddh Yogis.